We learn, from a very young age, that being patient is a virtue. We treat impatience as a weakness. And procrastination is the big bag flaw. Many of us spend a lot of time beating ourselves up because we are too impatient or we procrastinate too much. Yet when we’re in the thick of things we often cannot tell if we are being patient or waiting or procrastinating. Not knowing the difference leads to thinking we are practicing patience when we are making common mistakes. The definition of patience appeared in last Monday’s post. But the definition doesn’t help us practice patience much. Learning what patience is not is a start. We often define impatience as the opposite of patience. Its definition is the quality or state of being impatient. Well, that doesn’t help much. But we get closer when we examine the definition of impatient: “not patient, restless or short of temper, intolerant, anxious.” But is that all that impatience is? The article explains that when we have a goal, and it’s going to cost us more than we thought to reach that goal, we experience impatience. That impatience may lead us to find more efficient ways to reach the goal. Being impatient may cause us to change goals and make us successful. While impatience can be a bad thing, efficiency and success aren’t bad. Is Patience Procrastination In Disguise? We judge the value of patience as positive and the value of procrastination as a negative. The definition of to procrastinate is “to put off intentionally and habitually.” Anyone hear “lazy” in that definition? In practice, procrastination is goal avoidance. This seems odd. Why do we avoid something we’ve identified as a goal? Yes, sometimes someone else, a boss or leader, sets the goal but usually, the job is something we chose to do. So why goal avoidance? Often the goal has a negative aspect—If you don’t quit smoking you’ll die of cancer. Or it’s a vague goal you don’t know how to approach or the goal is too big and you fear (sometimes with good reason) that you’ll fail. The fear and anxiety that develops create that avoidance reaction. Try to NOT think about a white polar bear for 30 seconds. Setting such an impossible task makes the white polar bear larger and more difficult. Think what it does to an already too large or too vague goal. Yes, even impatience and procrastination can be good things. Impatience motivates us to reduce the costs of reaching our goal or to switch goals. Procrastination, if used productively, gives us time to reflect on our whys. Realizing that we’ve set the wrong goal or we need to change goals is important. Learning to set specific, reasonable, and actionable goals is not an easy thing to do. Commitment to goals is an intensely personal thing. So your goals methods may not work for someone else. If you need help learning to set goals, learn how to make S.M.A.R.T. goals or try this Goal Trainer. Need help making writing goals smart? Try this site. When we’re impatient or we’re stuck in a pattern of procrastination there are some questions to ask ourselves. What is my goal? Is it specific, measurable, achievable, results-focused, and time-bound? What do I now think it will cost? Is there a way to reduce the costs of reaching this goal? 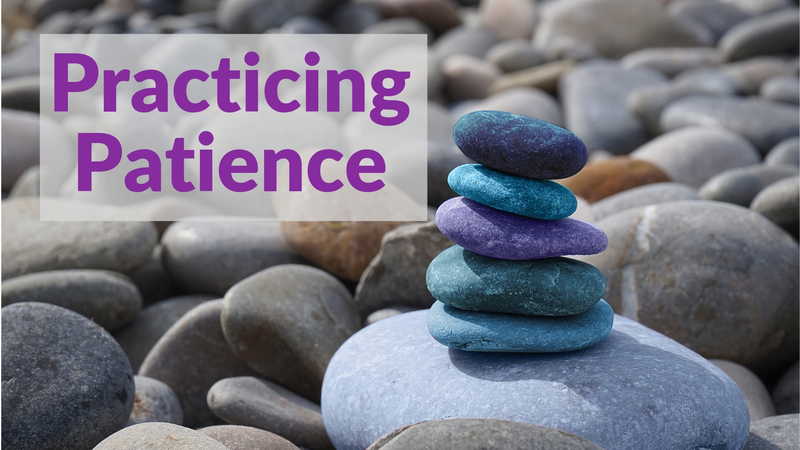 Making patience a habit takes practice. Learning to use impatience and procrastination to move you toward your goals also requires practice. Will you make these common mistakes even after practicing all these things. Of course, you will. We all do. Every day. But knowledge is power. Learning these things helped me. Did it help you? My Frustration vs. My Patience, Which Will Win? Interesting way to look at it. Both have been a big problem for me lately. I think the difference is that the way you are pointing out, both can be good when something productive comes from them, but beyond that, they’re just a waste of energy (impatience) and time (procrastination). Jennette, I understand the frustration. I hope you’re not beating up on yourself with the “waste of energy and time” thoughts. It’s human nature to do be impatient sometimes and to procrastinate sometimes. Sometimes they turn into habits. And they can be difficult habits to break. (Don’t ask me how I know.) I read on your blog that you’ve tried something new and it’s working for you. Good. I hope it helps you get back into the habit of writing.